VENEZUELANS ARE GOING to the polls today with President Hugo Chavez facing his toughest election in his near 14-year rule after youthful rival Henrique Capriles galvanized the opposition. Voters stood in lines to cast their ballots while Chavez supporters played bugles to rally supporters of the president, who is seeking a new six-year term to cement his socialist revolution. The 58-year-old leftist leader held a 10-point lead in the latest opinion poll, but Capriles, 40, has attracted huge crowds at rallies while other surveys have put them in a statistical dead heat. Chavez retains a loyal following among the country’s poor, who have propelled him to easy victories in past elections, but Capriles has narrowed the gap in opinion polls after an energetic door-to-door national campaign. Weakened by a bout with cancer, the president stepped up his campaign this week, even dancing in the rain at a Caracas rally on Thursday as he pleaded for another six-year term to seal his oil-funded socialist revolution. Chavez, a fierce US critic, is a highly polarizing figure who survived a coup in 2002 and became popular with the long-neglected poor for using the country’s vast oil wealth to fund health and education programmes. Facing his biggest election challenge, Chavez has admitted making mistakes, vowing to “become a better president” if re-elected. The business-friendly, center-left Capriles has hammered Chavez over the country’s regular power outages, food shortages and runaway murder rate, which has risen to 50 homicides per 100,000 inhabitants. Around 19 million voters are called to the polls. Some 140,000 troops have been deployed to prevent violence while alcohol sales are banned until Monday. 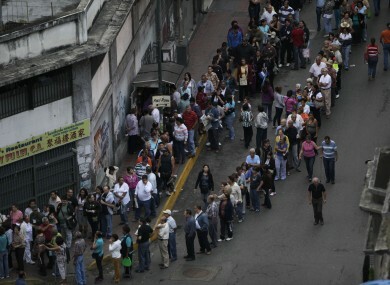 Email “Poll open in Venezuela in tough election for Chavez”. Feedback on “Poll open in Venezuela in tough election for Chavez”.